Videos Black and White Tapes (1970-75), Rocky (1976) and Painter (1995). Courtesy the artist and Hauser & Wirth. 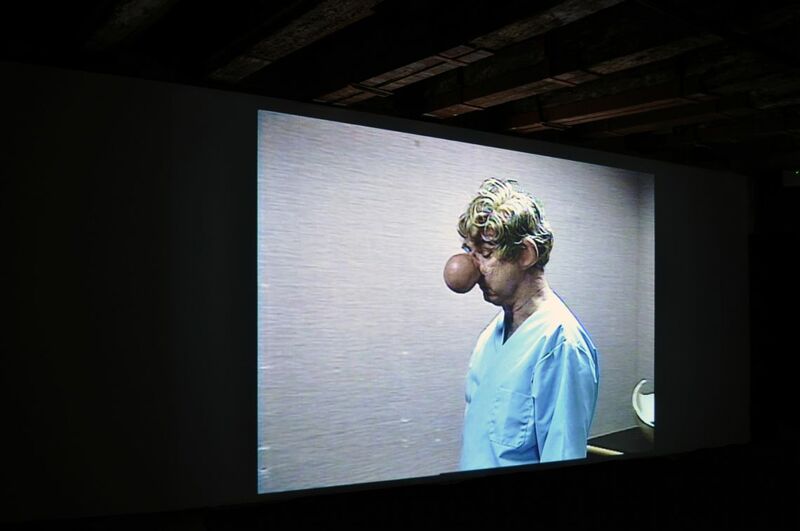 Paul McCarthy (born 1945 in Salt Lake City, US) gained recognition for his intense performance and video-based work on taboo subjects such as the body, sexuality, and initiation rituals, also exploring themes of family, childhood, violence and dysfunction while using bodily fluids, paint, and food to create elaborate and grotesque critiques of cultural icons. His multifaceted oeuvre includes sculptures, installation, film and "painting as action" to often questioning the effects that violence and mutilation, both real and simulated, have on the viewer in contemporary culture. McCarthy is a bright critical analyst of the mass media and consumer-driven American society– its hypocrisy, double standards and repression. "I had this thing about exposing the interior of the body", McCarthy says, "the orifices leading into the body, and what the interior was, and the taboos of the interior” (Jones, 2011) … and "I never thought of my work as shamanistic. My work is more about being a clown than a shaman." (Petersen, 2006). Black and White Tapes derive from a series of performances Paul McCarthy undertook in his Los Angeles studio from 1970 to 1975. Conceived for the camera and performed alone or with only a few people present, these short performances reveal the nascent development of the themes, the raw physicality, and the performance personae that mark McCarthy's well-known later works. In several pieces, McCarthy uses his own body as a tool to examine the process of making art in conceptual exercises. Absent or present, the human figure is a constant element in his work, whether in the form of bodies in action, or a satirical Beckettian caricature as in his video Rocky (1976). Miming the manner in which actor Sylvester Stallone plays the character Rocky in his 1976 block-buster film, McCarthy's character shows contrasting frustrated motions – continuously punching himself until exhaustion – blocking the character in a traumatic state which Freud described as the 'repetition compulsion'. Here the 'idol' destroys itself and reveals to be a social failure, behaviourally dysfunctional. McCarthy's Rocky is unbearable and yet compelling, revolting but also surely comic. Confusing codes, mixing high and low culture to thought-provoking reflection on fundamental beliefs, the film Painter (1995) undermines the idea of "the myth of artistic greatness" and attacks the perception of the heroic male artist. It is a potent provocative work, dense of iconoclastic irreverent wit, which lampoons polite society, its hypocritical formalism ridicules the authority of a certain sickening art system.